In the beginning of the 17th century, Cheikh Abou Nader el Khazen, who worked as a Moudabber for Prince Fakhreddine The Second, built near his residence in Ballouneh a church dedicated to Saint Anthony of Badua (Saint Antoine De Padou or القديس أنطونيوس البدوانى). After relocating to Ajaltoun, the church became a private wakf in the name of the Khazen family. In the second half of the 18th century, the church was undertaken by the Fakhr Cheikhs from the house of Abou Nassif Nawfal el Khazen in Ballouneh. In 1782, the church was renovated by Cheikh Fakhr Abdel Malak el Khazen. in 1882, Cheikh Abdallah Rochdan, Cheikh Fakhr's grandson, was buried there. In the 20th century, the church became under the patronage of Cheikh Fares Semaan el Khazen and remained that way until now. 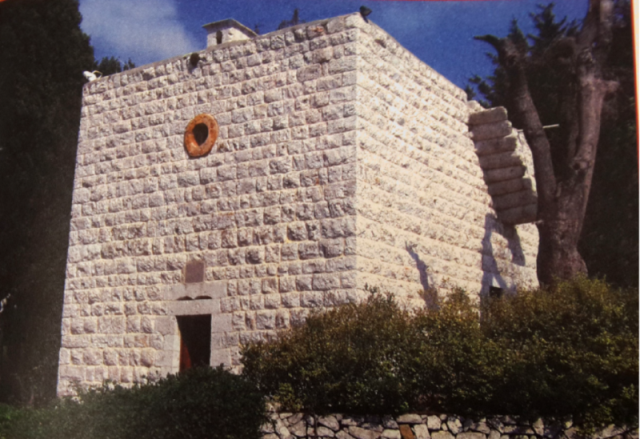 In March 1996, Cheikh Fares' grandchild Cheikh Charbel Melhem el Khazen renewed and renovated the church before he was buried there upon his death in 1998. PS: Picture and Original article are found in the book entitled "مشايخ آل خازن كنائس واديار وأوقف" by Alain Chehwan.